Recently, I conferred with two social workers who discovered that their professional and personal lives intersected in ways that made them feel uncomfortable. Both of these colleagues sought consultation in an effort to sort through the challenging boundary issues. One is a clinical social worker who counsels a couple experiencing marital difficulties. According to the couple, most of their conflict arises out of the challenges they face parenting their adolescent daughter who struggles with anxiety, attention-deficit/hyperactivity disorder, and depression. During the course of their counseling, the couple decided to transfer their daughter from the local public high school, where she experienced significant social and academic challenges, to a private, alternative high school located in a neighboring community. This school’s mission is to serve students who face academic, emotional, social, and behavioral challenges. As part of the school’s program, the students’ parents participate in monthly meetings that function as a support group and provide an opportunity for parents to talk about their personal challenges that may affect their children, such as marital, mental health, and addiction issues. Coincidentally, the social worker’s son also goes to this school. The social worker and his wife attend the monthly meetings, during which they sometimes disclose personal information about their family’s life and challenges. The social worker is uneasy about attending these meetings with his clients present. The social worker has found the school meetings to be very valuable. He understands, however, that merging his private life with his professional life by attending meetings that his clients also attend would introduce boundary issues to their relationship. In the second consultation, a social worker at a community mental health center provides counseling to a 38-year-old man who sought help following the death of his wife. In therapy, the client has spent considerable time talking about the difficulty he has had mourning his wife’s death, feeling socially isolated, and being a single parent to the couple’s two children. The social worker is an active member of a local church, a congregation with nearly 1,700 parishioners, one of whom is the client. At the end of a recent worship service, the minister announced a new social action committee planning to identify compelling issues in the community (eg, related to hunger, homelessness, elder affairs, and child welfare), organize parishioners, and advocate with government officials for constructive social change. The minister encouraged congregants to contact the church office if they wished to join the social action committee. The minister announced that the newly appointed committee would hold its first meeting at the chair’s home in two weeks. Unbeknownst to the social worker, the client telephoned the church office to sign up for the new committee. The client appeared at the social worker’s home for the first meeting. The social worker was concerned about mixing her personal and professional lives, the client’s presence in her home, and the potential impact on her relationship with her client. Ordinarily, social workers are able to separate their professional and personal lives, as they do not socialize or become friends with clients. On occasion, however, social workers’ professional and personal lives may intersect, often in unexpected ways. As in the two case scenarios, clients may turn up unexpectedly in social workers’ private spheres. Social workers may have little or no control over the possibility that, for example, their clients’ children and a social worker’s child become playmates or friends. A social worker’s spouse and a client’s adult son may work closely together in a local company. Especially in small and rural communities, it may be virtually impossible for social workers to avoid encounters with clients in social settings. The same is true for social workers who are members of a particular ethnic group and also provide social services to that community. Thus, it is unrealistic to assume that social workers can always separate their professional and personal lives, try as they might. Certainly social workers should have the freedom to pursue their social, religious, cultural, and recreational interests. Ultimately, social workers must aim to maintain the clearest possible boundaries, recognizing that instances will arise when those boundaries are somewhat blurred. Above all, social workers should strive to create reasonable boundaries that protect clients and are not self-serving. The language in the National Association of Social Workers’ Code of Ethics is helpful. 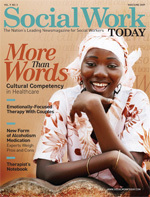 One of the code’s standards focuses explicitly on social workers’ obligation to maintain clear boundaries in their relationships with clients: “Social workers should not engage in dual or multiple relationships with clients or former clients in which there is a risk of exploitation or potential harm to the client. In instances when dual or multiple relationships are unavoidable, social workers should take steps to protect clients and are responsible for setting clear, appropriate, and culturally sensitive boundaries...” (standard 1.06[c]). In addition, the Code of Ethics includes a standard that directly addresses the relationship between social workers’ professional and personal lives: “Social workers should not permit their private conduct to interfere with their ability to fulfill their professional responsibilities” (standard 4.03). Drawing on these guidelines, it would not be appropriate for the social worker whose child attends the same school as the clients’ child to participate in a support group with his clients that is sponsored by the specialized school that their respective children attend. Ordinarily parents in this support group share very intimate information about their personal and family lives. In this unique situation, the social worker would need to discuss the boundary issues with the parents to ensure that they understand why the social worker needs to separate his personal life and professional work. Ideally, with the clients’ consent, the social worker would explain the unusual situation to the school’s staffers and discuss suitable alternatives with them that would avoid the inappropriate dual relationship. Similarly, in the second case, the social worker would need to take steps to ensure that her private life, as chair of the church’s social action committee, would not lead to an inappropriate dual relationship with her client. The fact that the client is struggling with social isolation and loss issues makes it especially important that the social worker establish clear boundaries. The social worker may need to discuss this issue with the client, talk about why maintaining clear boundaries is important, and explore ways for him to become involved in church affairs that would not create boundary issues. The social worker would need to be prepared to deal with possible clinical ramifications, such as the possibility that the client will feel hurt and rejected. Social workers may disagree about the extent to which their private conduct is germane to their professional work and poses risks to clients. It is difficult to prescribe strict, unambiguous criteria for determining when practitioners’ private conduct interferes with their ability to perform their professional duties. As a general guide, social workers should attempt to distinguish between private conduct that directly interferes with, or has the potential to interfere with, their performance of professional functions and obligations and private conduct that is tangential or unrelated to professional obligations.